Conditions and Attractions: 80 miles. Paved road, open year-round. Mountain scenery, numerous trailheads, fishing and winter-sports options, wildlife observation; access to Kenai Lake, Exit Glacier, and Seward. After threading the shoreline of Turnagain Arm to Portage, the Seward Highway heads south onto the Kenai Peninsula, passing through long glacier-carved valleys on its way to roads end at Seward. The route features the splendid scenery of the Kenai Mountains, beautiful lakes, five easy passes, glacier access, and many recreational opportunities. Allow about two hours with no stops for the 80-mile drive. The mileposts are listed in descending order since most travelers will travel the Seward first from north to south. Portage Glacier (Mile 78.9)See chapter 9. Turnagain Pass (Mile 68.5, 988' elevation)The road crosses out of the Ingram Creek valley and into the Granite Creek valley, descending for a time before heading up again at the junction with the Hope Highway. At the pass is Turnagain Pass Recreation Area, a popular winter-sports zone. Snowmobilers head out west of the road while cross-country skiers own the east. Johnson Pass North Trailhead (Mile 63.7)See Kenai National Wildlife Refuge/Chugach National Forest Trails, above. Granite Creek National Forest Campground (Mile 63)Good creekside sites for $6, fishing, trail access. Hope Highway Junction (Mile 56.7)Turn north here to reach the historic mining town of Hope, the north end of the Resurrection Trail system, and the Gull Rock Trail along Turnagain Arm (see Hope, below; and Kenai National Wildlife Refuge/Chugach National Forest Trails, above). Devils Pass Trailhead (Mile 39.4)This route climbs steeply to the west to link up with the Resurrection Trail (see Kenai National Wildlife Refuge/Chugach National Forest Trails, above). Sterling Highway Junctions (Mile 37.7 and Mile 37)Turn here if youre heading for the Kenai River, Kenai National Wildlife Refuge, Kenai, Homer, or the Southwest. Carter Lake Trailhead (Mile 33.1)From this point, you can take the Carter Lake Trail (3 miles, 1,000' gain) up to Carter Lake for fishing and views. 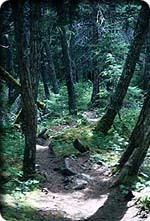 The trail becomes the Crescent Creek Trail, part of an excellent long-distance hiking route (see Kenai National Wildlife Refuge and Chugach National Forest Trails, above). Johnson Pass South Trailhead (Mile 32.6)See Kenai National Wildlife Refuge and Chugach National Forest Trails, above. Spruce Moose Bed-and-Breakfast (Mile 30.1), Moose Pass, 288-3667. Two nice chalet homes. Great for families or groups. $120 and up, open year-round, hot tubs in winter. Trail Lake Lodge (Mile 29.5), Moose Pass, 288-3101. Restaurant, bar, motel. Rooms $90$100. Moose Pass (Mile 29.4)This little settlement on Upper Trail Lake (population 119, 11 percent native) began as a camp for the builders of the Alaska Railroad, which parallels the road from here to Seward. North of town, the rail line follows the original Iditarod Trail route to Portage. The actual pass is a narrow strip at the south end of Upper Trail Lake. Another low divide lies between the west end of the lake and the Sterling Highway junction. Moose Pass has food, gas, and lodging options. Trail River National Forest Campground (Mile 24.2)$6 campsites and access to the shores of Kenai Lake. East of the road, the Falls Creek Trail (3.2 miles, 1,000' gain) climbs into a steep valley past mining claims. It is officially 3.2 miles, but the valley continues to climb fairly gently at trails end and its tempting to keep going. About 9 miles in from the highway, it reaches a high saddle, 4,000-foot peaks, and glacier access. Conditions may be difficult. RThalfall day (or more). Ptarmigan Creek Trailhead and Campground (Mile 23.1)Theres a 16-site campground east of the road here. Sites are $6. The Ptarmigan Creek Trail (9 miles, 200' gain) reaches Ptarmigan Lake in 4 miles, then follows the narrow lakes northern shore. RThalfall day. Primrose Creek Trailhead and National Forest Campground (Mile 17)Turn west 1 mile through area homes to reach $6 sites overlooking Kenai Lake. From the campground, the Primrose Creek Trail (5-plus miles, 1,500' gain) follows Primrose Creek above treeline to Lost Lake. From the west end of the lake, there is access to the gentle high basins of this small massif. The trail continues along the east lakeshore and becomes the Lost Lake Trail, which continues south to the trailhead near Seward. The two trails combined are about 16 miles long. RTall day. Grayling Lake Trailhead (Mile 13.3)The Grayling Lake Trail (1.6 miles, 200' gain) climbs up to Grayling Lake, a small fishing lake in thick forest. Theres also access to Meridian and Leech Lakes. RT34 hrs. Exit Glacier Road (Mile 3.7)Turn here to reach Exit Glacier and the Harding Icefield Trail (see below). Theres also access to the Resurrection River Trailhead, the south end of the Resurrection Trail System (see Kenai National Wildlife Refuge and Chugach National Forest Trails, above).